All our sound proof cabins are designed to allow the maximum aspiration and cooling airflow required, so the machine does not overheat. Acoustic louvers, splitter and baffles are provided to suppress the noise where require. Anti-Vibration mounts can also be provided where required. Many special features are available depending upon the application. In order to append and respond to the emerging requirements of esteemed clients, we are offering a superior range of Acoustic Cabins. 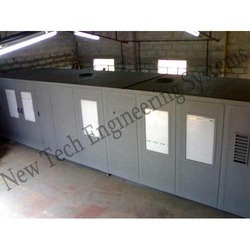 This range of acoustic cabins offered by us is ideally utilized for noise making machines, sound proof office chamber, cabins and allied. Along with this, the offered range is appreciated among the clients for its high performance and superb efficiency. These products are suitably designed in strict compliance with the international quality norms and standards. Looking for Sound Proof Cabin ?